Following the success of King of the Groms, the international contest that hunts down the newest talents in surfing, Quiksilver has launched a winter version, the Young Guns Snow, a global contest dedicated to young snowboarders 18 years of age and under. This very initiative, that helped showcase the young surfing prodigies Gabriel Medina and Matt Banting, aims to do the same in snowboarding, and reveal the next Bryan Fox or Travis Rice. For a chance to win this young snowboarding talent contest, kids around the world are invited to post their videos of their top clips, showcasing their talents on social media and the official site, www.quiksilver.com. Then, the Quiksilver team rider Bryan Fox, the exclusive judge of this first edition, will have the honor of choosing the 10 top riders that’ll then get the public vote. The winner will walk away with a trip for a week snowboarding in the USA with the talented man of backcountry, Bryan Fox. 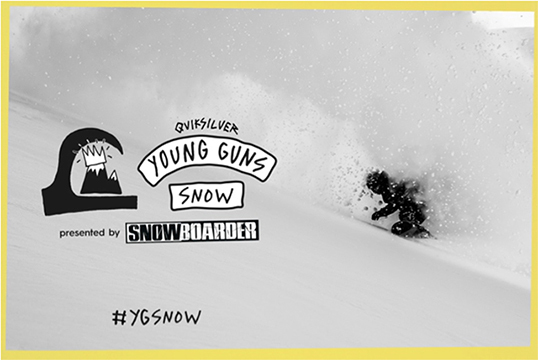 The young participants are invited to post one or several clips of themselves, showcasing their snowboarding flair on Instagram accompanied by @quiksilver and the hashtag #YGSNOW. No guidelines, no rules, no enforced tricks. Candidates can enter as many times as they want. To stand out from the rest, the young riders have to be as imaginative and original as possible in their clips. The #YSNOW judge, Bryan Fox, will then pick 10 snowboarders with the biggest potential, who’ll then directly access Round 2. The 10 candidates still in contention have to make a video 1 minute long, recapping their best tricks on a board. All clips will be posted on the Young Guns site and left to the public vote. The 10 remaining candidates have to step up their game to get more votes. With the help of Facebook, Instagram, Snapchat, etc, they have to get a maximum number of ‘likes’ for their video, in an attempt to win the first edition. On the 29th of March, the rider who has gained the most votes, will be awarded the first Young Gun of snow title. The winner of the Young Gun Snow will be flown to the US for an unforgettable snowboard trip with the Quiksilver team rider Bryan Fox. The all expenses paid trip, courtesy of Quiksilver will include a session at the High Cascade Pro camp in Mount Hood.